I've I wanted a tower that consisted of large outer veins and then two independent internal veins inside can I just "transform" a complete model to get the dimensions I want and mirror a vein to get the two internal contra rotating veins? If not - some help with scaling would be great? Can you? I intend to "mock" silver and gold leaf the veins and then paint with several thinned costs of a UV stable resin. A beautiful example of a Darrieus turbine. This is a great design. Would like to know how the supports are removed from the tiny holes that are on the blade. I am planning to drill a hole, not sure if thats a good idea though. Hi, the supports all around should be very easy to clear if you are printing at 5% infile (assuming Kura). I use an exacto knife and a pair of needle nose plyers to clean them. I really like this design and have posted a made one already. However I am wondering if the length of the struts have any effect. The description mentions 150 mm. Would for example 200 mm have a negative effect on the amount of wind it needs before it starts turning? Wind turbine dynamics is a really, really big topic. Do a web search if you want to learn up on it. Cliff notes version is, the longer the lever (spoke) length, the more torque and the easier it starts, but the less efficient it is at producing power. ill keep an eye for this driving around perth. there are quite a few of us from here ive seen on here but i haven't made the effort to go to any meetups. i'm an aeronautical engineer by training, my suggestion for Mk3 would be to change your aerofoil angle such that a portion (5-10%) of the lift goes in the vertical direction. that way it helps to lift up the weight from the bearing mount and reduce friction. i also suspect that you could try reversing the helix direction. i looked on google and it seems half the helical designs go one way and half go the other way. the airfoil design you would have read would be focused on 2d cross section; in 3d flow, there's a component of (in aircraft terms) spanwise flow. think of the airflow in the vertical dimension, right now, the preference is for the airflow to move up the helix, causing a downward pressure on the mounts, increasing 'weight'. i'm just paper-warrioring, thanks for building this! what the j couldnt you just this design upside down and accomplish said uplift>? First of all I'd like to say that the project you have here is amazing. Mike, your work is very much appreciated! I'd be interested in going forward with your MK3 designs. Maybe you could incorporate whatthej's ideas too? What he said makes sense in my (limited) mind! In my research I have learned that increasing the blade length increases the collection area disproportionately (Power = 0.5 x Swept Area x Wind Velocity Cubed). This means that you can get multiple times the power output just by doubling the overall size. Bigger is definitely better! Does anyone happen to know if the design would be more efficient to up-scale proportionately (larger blades, larger overall diameter), or just to append to the top and continue the curve further around? I guess my question is how do you calculate the swept area? Would you mind uploading your files in step format? I'm using a different CAD-Plattform and i can not open .scad. I'm goining to build one of these beautys! How do you convert the motion to elecrical current? 'm wondering if it is possible to mount it directly to a bicycle hub-dynamo... Anyone tried?! You can use anything that generates electricity when spun. This includes something you should be intimately familiar with already: Stepper motors! You can connect a stepper motor (windings in counter series) to a charge controller and plop a lithium cell onto it, and you've got yourself a nice regulated supply! I would suggest belting the turbine to the motor with the motor's shaft sticking out of the bottom of a nice weatherproof container. You can print various pulley sizes to trial-and-error it to whatever ideal ratio is for your area's wind speeds. Can i scale 625mm tall to 150% ? then it will be 937.5mm it wil work ? if not can u make model of 1meter height ? I never wrote it up as a material list, but if you read through the description, it describes all the bits. If you're not clear on any of it, let me know. IIRC, these blade type windmills need a push start to work. I like the design of the wings and all, but I'd like to know, if it could be made the classic way: with leading/trailing edge, ribs and shrinkfoil, like RC-airplane wings? Is there a chance to use a center-spine and printed or lasercut ribs, to make the skelett of the wings? Let me know if you do it. I'll check your scad file and see, if I can isolate the NACA profile and the code to generate the helical shape. Maybe make it a remix of your design, if you don't mind? It'd be awesome to see someone do a remix of it! Made one and tried it sticking out of a car. Something is wrong since it did not rotate even when going 110km/h. Felt like going faster made it lock even harder into some position. I used ball bearings and it rotates freely. I sent a more detailed PM, but I think the issue is the single bearing mount; I think it's getting probably loaded up too heavily. If you add a second one I think you'll have more luck. It looks awesome in black! I will not stop of course and post results once I get it working. I got it to work! I added savonius, then accidentally saw that one helical blade was facing wrong way :-D I don't understand .. 5 people were looking at the turbine and no-one (including me) saw this :-D Unbelievable! Anyway it works, but it is not generating as much torque as I expected. I will connect it to 50w PM generator and see, how much it makes electricity. If nothing, then I will scale up the mill and try bigger. The savonius and the helical blades should be connected with a frewheeling bearing, so the helical can spin faster than the wind. Which the savonius can't do, so it starts breaking the helical at some point. Thanks for the tip. Do you mean by freewheeling, that just normal bearing should be between helical and savonius? It's hard to control friction inside the bearing. Some bearings have more, some less friction, and friction can change outdoors. But this is how it's solved normally? The helical is fixed on the center shaft, but the savonius connects by a freewheel bearing ( special kind of needle bearing ). Now the helical can turn faster than the savonius, but not slower. I'm really interested to know how much power (if any) you can get out of this. By the way, these helical ones are self starting, though the savonius will certainly help. Sorry but I do not understand very well how to hold the bearings to fastening piece to ensure it. A detail photo would be welcome. The bearings were a push fit. i.e. you just press them in by hand and they should stay there. If they're loose you could adjust the size of the housing or maybe just wrap a layer or two of electrical tape around them to get them to stay put. My bearing is slack into the housing so I don't know if it worth but anyway I am designing and reviewing a new piece just to solve this issue. Maybe I'll share it here. I just finished making one of these and mounted it about 15+ feet above the ground. With winds of about 5+ mph i am getting no motion. It spins very well with very low torque when i spin it by hand. Any help? Thanks! Printed everything .... Where do I find the 4mm carbon RODS in Montréal Québec for a reasonable price??? Found these but I dont want to wait again! This is sort of a weird question, but in the SCAD file for the turbine, how did you originally generate the series of points for the polygon(s) that are extruded into the aerofoils? Was it something like MatLab? I'm a huge fan of OpenSCAD and I'd love to learn how to make complex curves like this! I got the co-ordinates from an online wing profile generator. I started trying to describe it with curves and decided this was way easier. I'd say getting something like matlab or even excel to produce the coordinates then just use them to describe a polygon would be the easiest I know of. That's great, thanks for filling me in! I have printed all of the pieces and am onto assembly, I am having a problem with aligning the the hubs so that the holes for the struts line up with the holes on the blades. is there a trick to this or am I missing something? use it with an air compressor and compress air... store it in a tank and then use that air to run an electric generator at night. Anyone got an instructables or one of these running generating electricity yet? I'm a noob on this. I need a starting point! You should connect it to a stepper motor to generate power. They don't take a lot of force to turn and out put voltage even at low RPM. You can pass it through a rectifier (easy to build) and get steady 5V, enough to power a small out door device, maybe a networked weather station? What electronics do you need to make this generate power? You need a stepper motor and a rectifyer as a stepper produces AC. There is heaps of info just google stepper motor generator. You could even use a small gearbox to gear it down so it will turn at lower wind speeds at the cost of some efficiency. Stepper motors turn quite easily and produce high output even at low rpm. Thank you for your speedy reply, I will look into this. :) I want to make a wind turbine that is a fairly compact size, isn't too expensive, and can produce a decent amount of power. What motor do you recommend if your area has A LOT of wind and the turbine is going to be spinning at very fast speeds? I'm not an engineer but I imagine to work this out with any accuracy you would want to crunch some numbers and work out how much turning force your turbine is going to have and match it up to an appropriate sized motor. The alternative (if the maths ins too daunting) is trial and error. You could start by just buying a NEMA 17 motor which is the most commonly used motor on 3D printers and try it. Another issue would be controlling the current draw. If the motors are hooked up to a battery charge controller directly there may be too much current being drawn for the motor to turn at all. Ideally you would have variable current draw as wind speed (turbine speed) increases with 0 draw at very low RPM to allow the turbine to spin up. Hi,i finally made and i have some questions. Mine is 440mm tall, so the space of 3 mounts (ThreadedMount02.stl) will be screws up every 150 mm ?If so, what is the size to cut the carbon fiber rod? They should be 150mm. When you glue them into the axial mount, make sure the threaded rod is in there first and that these push in all the way to it. That way they all stick out by the same amount. i would love some more info regarding printing like holow or infill? 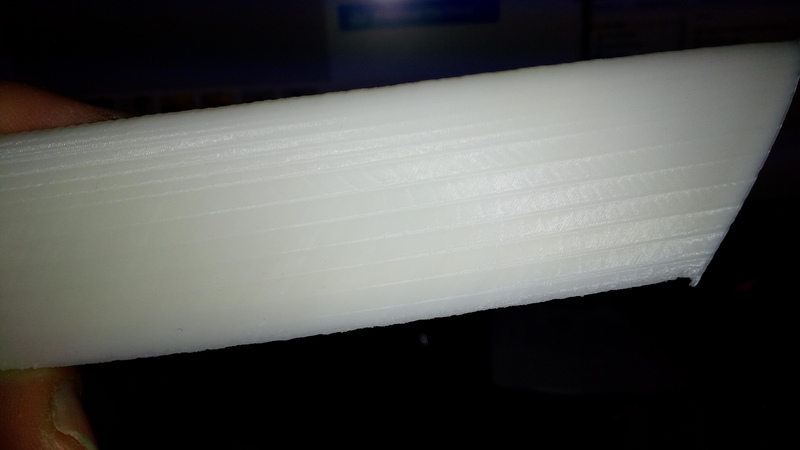 is it possible to print more segments and make it bigger? The blades have a wall thickness of about 2 or 3mm (from memory) and a void within that. So if you print at 100% infill, it still comes out as a hollow structure. The bearings were just standard skateboard / roller-blade bearings. OMG< JUST WHAT I WAS LOOKING FOR! Will this power my entire house or only computer and network? I think you might be aiming a bit high. Mine doesn't power anything and it spins gently if there's a decent breeze. Unless you print one MUCH bigger, this is just a pretty sculpture. Great build thanks I've always want to make one of these. I installed it outside and the wind was 15 mph it isn't spinning very well. I made the three piece first download option. The bearing are new it spins by hand good there is a bit of start up resistance do to the weight of all the hardware. If i start it by hand in the wind it will spin longer than if there is no wind so its doing something. I want to make a larger one next but i need to find out why its not spinning in the wind. Any help would be greatly appreciated and thanks again for a great build. It seems to really need clean airflow. For mine, when the airflow is messed up by things like trees it barely spins, even in a strong breeze. When I get clean air it works in a MUCH lower wind. A really smooth surface to wings and a sharp trailing edge improve performance. Some bearings are shipped with really thick grease, which creates a lot of resistance. If you can replace it with something like a thin machine oil it'll probably help. Hi , can somebody explain me why i have those lines? Hi. The lines look like the defined points of the wing profile. I'd sanded the blade pretty thoroughly, so they all disappeared. If they're a problem and you're really keen, you can look online for a wing profile generator and generate a more detailed set (really not as hard as it sounds). Do you think you could post your source for the carbon rods? I'm afraid my source for the struts was an old golf umbrella that someone had tossed out. If you feel ok about SCAD you can just tinker with the strut diameter to suit whatever you can find. Good luck! Hi Lofton. I like the idea, but I think it would screw with the holes for the struts. I've got the files together for the mk3, but I've realised that my printer can't do the sort of size that I was after and I'm not really that keen on using so much filament by doing it in little pieces. I think a makerbot has a build envelope that would suit it better. We use the E3D Volcano Nozzle as well so you get FAST strong prints. Hello, Mike. Didn't see your note...sorry! I have a PowerSpec 3D Pro printer. Build volume is 226mm x 144mm x 149mm. Filament from the store where I bought the printer costs $14 USD per kg so I don't worry about "wasting" the stuff. Print time is another matter altogether. However you want to design this thing is fine with me. I had planned to get 8mm CF rod for the center post. That size isn't hard to find here. Once it's done and spinning I'll post pics, videos and celebrity endorsements. Let me know when it's ready! Thanks, Mike! But I have carbon rod of 5mm and I'm trying to modifying it in scad but I receive "Parser error in line 72: syntax error"
all files, same error, same line. Thanks. I just checked one of them and I'm not getting the error.I'm using version 2015-03 though, so I've probably done something that doesn't work with the previous version. yes, indeed. There is actually a lot of change with this new version of openscad. Got miy thing assembles and put it front of a fan. It spins! And looks awesome, downright elegant. Not sure how it will do with "regular" wind, though. I want to extend the top and bottom segments of each vane to create the effect we see in figure skaters. I also need to add color to the vanes...clear is not visually striking. What might be the effect of making the vanes wider, do you think? It's almost dark now so pics are not possible. Tomorrow, hopefully, if I get home early enough. Thanks again for your thoughtfull design! A neighbor provided a length of 8mm holow aluminum tubing. It's light weight and the center spools fit snugly. No young'uns in the house (if you're from New Jersey you'd call them "youts"), so I went yo a sporting goods store and bought a set of in-line skate wheels, from which I removed the bearings. The bearings were secured to the aluminum shaft using very thin CA. I made a bracket to hold the bearing guides using wood scraps from the shop. So now I have a center rod, a base and bearings to let the wings rotate freely. I had some CF rod stock from another project from which I cut nine 150mm lengths. The rods stock was too small for the center hubs so I built them up with heat shrink tubing. Then each rod was secured to the hub with thin CA. Very strong. Now i need to attach the vanes to the cf rods, and will have to guess at the angle from top to bottom. Does this matter? Tried to attach photos without succes. Will try again later it ir appears they will be useful. The wider vanes would definitely make a difference; for this diameter they really should have been about double the width to get the best efficiency. As for the angle, if you get the struts the right length, and have the rod mounts separated by the right amount (this is in the instructions), the angle should work out. Each blade is supposed to cover 120deg. I'd love to hear how you go with it. So now I need your help, please. The angle issue "solved" itself as you suggested. However, I have no skills on the design software side of things, and don't know how to make the vanes wider without messing up the overall geometry. Your 5-segment vane design looks like what I want, but with the 2x wider vanes. The vane length for that design is perfect for my printer (I had to scale the 3-segment version to 88%). Can you please steer me in the right direction to make these changes (or better yet, make the changes for me)? If I'm asking too much please say so...I won't be offended! Photos and videos of the finished product WILL be provided with accolades and attributions. Incidentally, I have the current version of your thing mounted to the fence at the back of my yard and it's quite striking, albeit still. No wind this evening. Thanks again for the design! The original size was a bit of a stuff up; it didn't fit in too many printers at all. Producing some new sizes is no big deal, so I'm happy to do it if you like. The bit that I'm a bit nervous about is how the 8mm rod will handle the extra load. When I look at mine in strong wind there's a fair bit of flex and I think if it were much bigger it would start to bend; once that happens it's not balanced anymore and just a matter of time until it fails. I'm having a go at a bigger one at the moment, so if you can hold off a week or two it's probably worth it. Let me know which way you'd like to go. Thanks immensely, Mike! I've had my 3D printer for less than a month and have not developed any skills on the design stuff. Hence my request. The 5-segment version of your current design fits my printer perfectly; the 3-segment version had to be reduced to 88%. But I already said this so please pardon the redundancy! My printer is a PowerSpec 3D Pro with a maximum build height of 150mm. In terms of the center rod I was thinking about getting an 8mm carbon fiber rod. Might be pricey but likely strong enough. I suppose 10mm might be better...what do you think? I do have 8mm bearings, though so i'm inclined to stay with that dimension. In terms of time, please don't neglect anybody or thing on my behalf! Thanks again, Mike. Please don't feel bad about asking. I'm enjoying this! If you're using a carbon rod, then I'd guess you'll be ok. The problem with a steel rod is that it permanently bends; a carbon one just flexes (until it snaps altogether of course :). The next one I do will be about 5 or 6 blades, 300mm radius (blades twice as far from the axle) and a blade width of around 80mm. I can do one like this for you if you like or if you'd prefer the equivalent of the 5-segment on with blade width doubled that's fine too. Let me know and I can probably do it tomorrow. This your thing, Mike. Do whatever you think is best and I'll enjoy it. If each vane segment is 150mm (thanks to my limitation on the Z axis) or less, we can stack up to out hearts' content. I look forward to seeing what you come up with. Very interesting project Mike! Do you have any figures for the turbine? I am interested if it can be connected to generator and how much power can it generate? How fast does it spin for say 5 m/s or 10 m/s wind? I've not measured any of these, but going by eye and memory it's probably something like 20 rpm in a 5m/s wind, provided the breeze is nice and consistent. I've really only had one day where the wind was coming from a direction that wasn't stirred up by trees and it worked quite a bit better than when it was swirly. Wow, just printed the 1st section and it is much cleaner than the baby version of the this. Little way to go but looking good so far! I found that the prints came out much better when we printed a few at the same time. I think it gives a bit more time for the base layer to harden up before adding the next. I'd forgotten about this, but I've just added a note about it in the instructions. I finished printing all parts yesterday using clear PLA. Everything turned out great! The joints between the wing sections are a little loose but I'm going to use gap-filling CA (probably Gorilla Super Glue, which has a more rubber-like consistency when dry, compared to regular CA). For the center rod, I'm hoping to find solid aluminum rod stock. I also need to track down a couple of bearings (who on earth has a set of inline skates sitting around the house?). Finally, I found I had some carbon fiber rods of the right diameter to use as struts. Can you advise on the ideal length for the struts in a 3-section blade? This thing looks way cool, even in pieces on my workbench. Can't wait to finish it up tomorrow. The struts need to be 150mm long. It's worth spending a bit of time getting them to all match each other, otherwise the balance will get thrown off. I've added a bit more to the 'axle' & 'struts' section of the instructions for how I put it all together. I'd love to see a picture when you get it all together. Other than that I don't believe they need smoothing/sanding... the blades look amazing already! wish I could put it together already! By the way, the sanding is about making the blade / wing work properly. A friend who knows about this stuff showed me some test results for a wing that had a surface finish equivalent to 60 grit sand paper. It half the lift and double the drag of the smooth version. I saw the photo. Its the first time I've seen my design done by someone else and I'm pretty stoked about it. It's hard to tell from the photo, but it looks like the struts might be longer than 150mm. If they are, it would throw the angle out which would explain it looking so different. Could just be that it's a bit shorter though. Extra style points for the chop-stick! That's a great feeling, congrats! I think we may have been talking about two different things with the holes for the M8 shaft. I was talking abou the axle (ie the shaft through the bearings); the carbon struts were 3.6mm on mine too. would it be possible to make the mounting part for the rods in a separate part, like the test part? so that the blades where smooth. the mounting is it the only possibility to kill the print on half way, as a bouns you could print all blades faster. I think the sockets can be improved on too. I guess you could use the test part (so something like it) and just remove the sockets from the blade. I'm not keen to post too many versions, but message me if you'd like this and I'll send something through (it's an easy change). My idea was to make the sockets completely internal, so that all you see from the outside is the hole through the skin. You'd still get the same surface area for gluing and it would make sanding much easier. I'll have a go at this on the weekend. I think when I get another 40x40cm fan and 'upgrade' the dual extruders' fans with the third fan I could get much cleaner prints! They look great. I'm glad to hear they fit alright, I wasn't sure how that would go on different printers. That's odd about the shaft diameter. I definitely used M8 rod, so I'm not sure why they'd be coming out different. I'll have a look when I get home tonight. You're right, I used 3 x threaded mounts & 2 x bearing mounts. The "2 x mounts" in the instructions was meant to refer to the bearing mounts; I'll change it to be a bit clearer. Awesome, one more question if I may, what is that other mount you added for? Is it if I choose to put it in a base? The other mount was for using straight rod rather than threaded. I had straight in mind when I designed it, but couldn't get my hands on any. When I printed mine they were 0.2mm layers, 40mm/s, ABS without supports. I did them three at a time and trailing edge was really clean all the way through. The only one where I had 'feathering' (exactly) like that was when I reprinted one on its own after the first go came loose during the print. I'm guessing that giving each layer a bit more time to set before the next starts is what makes the difference. Once I'd given everything a bit of a sand, I couldn't pick from the others. I didn't change the diameter on the 375mm version, so it would have a slightly steeper overhang angle than mine, but I don't think that's the problem. If the idea above doesn't fix it I can reduce the diameter a little. I have to say, you may be onto something... I'm printing 3 at a time now, 15% infill, and so far so good... will take about 5 hours but it's a great project. I was a bit worried that the longer length of the 625mm version might make it a bit fragile, so I've reposted it with a wider blade; . I've increased it to 60mm from 40mm in the original. Bugger! When I sized it, I forgot to allow for the connector plug. I've added a couple of extra .zip files that should be printable in a replicator 2x. There's a 3-segment, 375mm tall version and a 5-segment 625mm tall version. For comparison, the one I printed was 440mm. Awesome! it fits perfectly, I will begin printing soon will post pictures when I finish :) Thanks! Very nice! I really like the contrast. Does it spin in light winds? Got a video? The wind's pretty swirly today, so it's hard to tell how much it needs. There's a video up now. Say thanks by giving miiiike a tip and help them continue to share amazing Things with the Thingiverse community. Vertical Windmill Mk2 by miiiike is licensed under the Creative Commons - Attribution - Share Alike license. Say thanks and help miiiike continue to share amazing Things with the Thingiverse community. You'll need a PayPal account to tip miiiike. Click the button below and you will be redirected to PayPal. Once the payment is complete, you'll be brought back to Thingiverse.